Today we're revealing one of our favorite summer wardrobe pieces. Any guesses? Hint: If you read the headline, you've got the answer. We're talking about cropped white jeans—crisp and clean, though sometimes intimidating to wear if you don't find a pair that works for you. Available in an array of cuts, from boot to wide leg to crop (the latter of which we're focusing on today), they make the perfect blank canvas from which to build the rest of your outfit around. While you may not want to wear white jeans to a summer picnic (hello, grass stains), you'll certainly want to invest in a pair for less stain-prone situations—a day trip to the city, drinks with friends, etc. Why are we such advocates for white jeans? Because there's truly nothing as versatile as them, and to be quite frank, they instantly elevate your look, even when you team them with a more basic top. 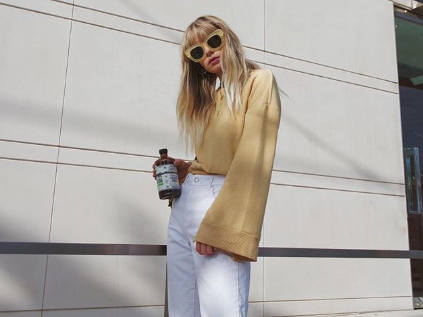 Cropped white jeans are an essential if you love classic style, but we highly recommend everyone scoop up a pair this season. Read on to shop our edit. Available in sizes 27 and 28. Next up, shop some of our favorite summer sandals to pair with your cool new cropped jeans.